There are many mountain biking tracks in Enontekio. You can do a different track for every day of the week. The tracks go in a pine forest and open fells with a spectacular view. There are suitable tracks for beginners and experienced bikers. 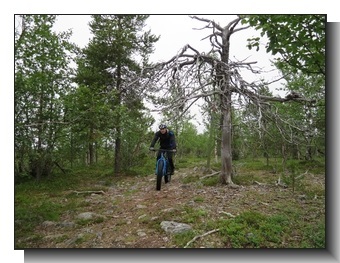 You can also bike in Pallas-Yllas Nationalpark. In winter, there is one ski track and many snowmobile tracks also for fatbikers. 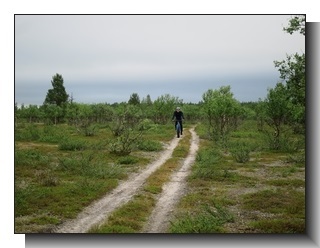 You can loan a map from Ounasloma and also download a free app, Rewindr, to find the tracks. Here are some of the tracks below. You can rent a fatbike from Ounasloma. Marked trail that is mainly easy, but some boardwalks and little uphill give some challenge for beginners. To the start point of this track is only 1 km from Ounasloma, so you don't need a car to bike this track. From the top of the fell Pyhakero, 711 meters above sea level, the view is beautiful. The trail is very visible, because it is a part of the most popular hiking route in Finland, Hetta-Pallas. The trail starts from the border of the national park Pallas-Yllas. There is a open hut with fireplace along the way. 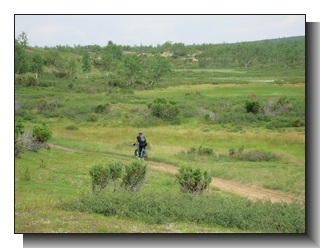 The first part of the trail is in pine forest and the trail climbs up to the fell and turns into a treeless landscape. Make sure the brakes are working before coming down from the fell! 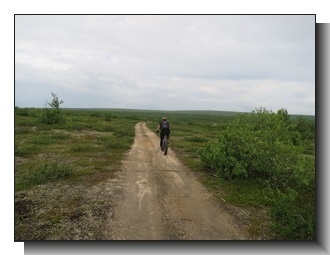 It is 12 km from Ounasloma to the start point of this trail, which include 6 km asphalt and 6 km gravel road. Another option is to loan free boat from Ounasloma and row 3 km to the other side of the lake and start there. Then the biking track would be 18 km. The track goes mainly in easy pine forest, but there are some boardwalks and rocky spots. There is nearly none uphill or downhill on this track. There is a open hut in half way. To the start point of this trail, Nature Cantre, is 3 km from Ounasloma. You need a car transport from the other side of the trail. There is a tractor road from Nakkala to Poyrisjarvi. Along the road there are nice fell views and ridges. The average tree height is 2 meters. 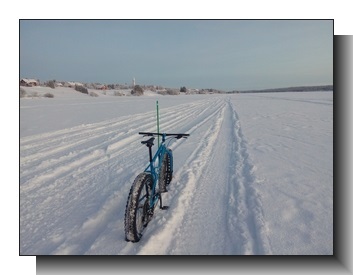 This track is mainly easy and it is recommended to use fatbike, because of the sandy road. There is an open hut at Poyrisjarvi, on the other end of track. It is 40 km from Ounasloma to the start point of this track. A quad track starts from Kalmankaltio to the north. After 16 km there is a open hut which is an good destination to this trip. The quad track is easy to bike. The landscape is open with very little trees. It is 60 km from Ounasloma to the starting point. Around the lake Ounasjarvi there is a skiing track marked with green sticks. This skiing track is allowed also for fatbikes. There is two campfire spots along the track and a cafe in the east. You can check the maintenance situation here.